Rob Butcher, vice president of media relations for the Cincinnati Reds talks about the upcoming baseball season during the Kiwanis and Rotary weekly meeting Monday at the Sidney Veterans Center. Rotary President John Bertsch, left, waits for Cincinnati Reds Vice President of Media Relations Rob Butcher conclude his talk Monday at the Rotary and Kiwanis meeting. 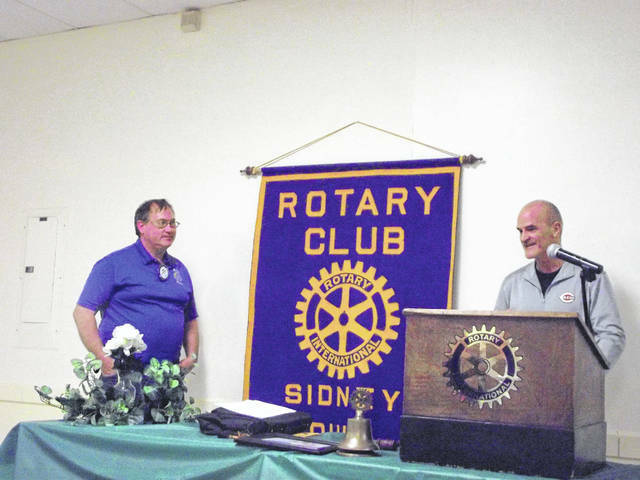 SIDNEY — Cincinnati Reds Vice-President of Media Relations Rob Butcher made his 20th consecutive pre-spring training visit to the Sidney Rotary Club at the local American Legion on Monday. “Our fans seem excited as evidenced by our recently concluded caravan along with the fine crowd here today. Since last year we have added a new manager, better starting pitching and a couple big bats.” he stated as he surveyed the room full of Rotarians and guests including the local Kiwanis Club. One Kiwanian loaned Butcher his glasses since Rob’s remained in Cincinnati. The change in managers really has Butcher enthused. “As we did our managerial search, my job was to call some of my contacts around the country to see how these candidates interacted with the media in previous jobs. 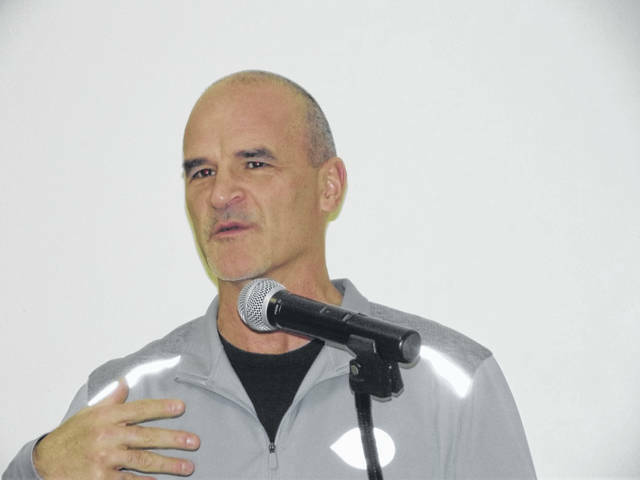 Most said ‘he’s great but…” about various prospects but that didn’t apply to Cincinnati native David Bell who most recently oversaw the minor leagues for the San Francisco Giants. Bell had also managed in the minors and coached in the majors including some time in the Reds organization. His grandfather, Gus, was a Reds outfield mainstay before and after the pennant season of 1961. Father Buddy manned third base for the Reds in the mid-1980’s and is now a team executive. He noted that only one coach was held over from Price’s staff. The new hitting coach was the Dodgers hitting mentor in 2018 while the pitching coach and his assistant have arrived from successful tenures in Milwaukee. “This is impressive. These guys want to work for David Bell,” he added. The new Reds manager and staff are fully immersed in the analytic side of baseball. “The information is out there and we will use it. I’ve learned that a pitcher’s spin rate can also help diagnose an injury,” he offered. The Wilmington native always fields questions from the audience which relayed more information to those in attendance. Now for a few highlights. Big anniversary: 2019 is the 150th anniversary of the original Red Stockings, the first pro team. The uniforms from each decade will be worn throughout the season. A fans open house will be held on July 5. The Reds Hall of Fame is receiving a total makeover. Center field: Not yet settled. Could be prize prospect Nick Senzel. Minor league coach and former big league catcher Corky Miller says Senzel can play anywhere and will be great. Marty’s finale: Radio voice Marty Brennaman’s 46th season in Cincinnati will be his last. He has a list of things he’d like to do while he’s still healthy. He’ll be honored in many parks throughout the season. Marty turns 77 on July 28. At this time of year I’m normally getting ready to go to Reds spring training to report back to our readers. I began in 1991 and haven’t missed until now. This year I need to stay home to address some health issues. I will miss doing those stories and getting your feedback. It’s realistic that I could start a new streak in 2020.
https://www.sidneydailynews.com/wp-content/uploads/sites/47/2019/01/web1_RobButcher-copy.jpgRob Butcher, vice president of media relations for the Cincinnati Reds talks about the upcoming baseball season during the Kiwanis and Rotary weekly meeting Monday at the Sidney Veterans Center.